Jim Burns is an artist from Wales and started his career in the 1970s. He's a sci-fi artist whose artworks have appeared on numerous covers and that is what he's probably most well known for doing. 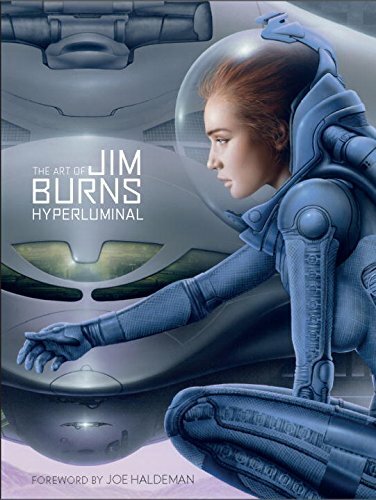 The Art of Jim Burns: Hyperluminal features a collection of artworks from Burns's career from the 70s to the recent years up to 2014. You'll see the book cover art he created for authors such as Peter F Hamilton, George R R Martin and many more. The artworks are reproduced huge in this coffee table book compared to the novels. Because of the size, you can see more clearly the amount of detail he puts in the paintings. He uses primarily acrylics, occasionally oils and also took up digital painting. The details and defined edges of his acrylics paintings are impressive. The artworks are credited to the books they are for, year and medium. The artworks are beautiful, well reproduced, particularly the ones painted with traditional medium. Digital ones still look digital though. Most are sci-fi, some fantasy, and a few surreal ones. The sci-fi worlds he creates are quite unlike those from other artists with his choice of colours, realism, details and design. They belong more to the traditional sci-fi art in those days as compared to the busy video game style concept art commonly seen nowadays. I've a minor quibble for page 110 where a face was cut into half by the page gutter. Overall, a good book for fans of his art. The Art of Jim Burns: Hyperluminal is another wonderful addition to the sci-fi artbooks that Titan Books have published in the recent years such as for Fred Gambino, John Harris and Chris Foss.